Ode II has no text and drops out as the silent number. The remaining Odes are introduced by an irmos, which acts as a link between word blocks, followed by four troparia, or hymnal stanzas, of which the last is always the Theotokion, or Hymn to Mary. The “intermezzo hymns” between Odes III/IV and VI/VII provide a summary function, not unlike a recap episode in a long-running series, except that here they are full-fledged episodes in and of themselves, each its own hue in the emerging aural ikon. The Kontakion and its Ikos are deeply rooted in the act of reading, as in the ways in which these hymns would normally be chanted, while the final prayer serves to close the circle in preparation for Communion. The lifeblood of the text is its refrain of “Have mercy on me, O God, have mercy on me,” which circulates like an involuntary reflex of the spiritual body. If there is a more heart-stopping, transportive moment in all of choral literature than the opening proclamation, I have yet to hear it. Sung with such passion in every single voice and rising in a collective exhalation of Godly energies, it never fails to halve me to my core. On the whole, the sound palette of the Kanon varies from barely harmonized periodic elements to full-blown organic compounds. Antiphonal glue holds the most fragile texts together in preparation for glorious leaps of faith, such as the passage in Ode III during which tenors and altos soar over a beautifully sustained drone. Ode VI is another notable moment, featuring cosmic ambulation between women’s voices over a deep cantus firmus. It is a vital motif, rocking between Heaven and Earth with baptismal impact. And one will be hard pressed to forget the doubling male soloists of the Ikos, which always haunts me long after its brief traversal. The tearfully arranged Prayer after the Canon distills the thematic energy even further, drawing with its pigments an image of such careful self-immolation that only silence can offer itself as palimpsest. The Estonian Philharmonic Chamber Choir is as much a treasure as the one who has provided them such bounty. They handle every note as the holy relic that it is, passed down through the ages and translated in song so that others may touch it without degrading its surface. The altos in particular emit an outstanding richness of tone. The recording space is potently reverberant, drawing out every pause like a comet’s tail. Listening to this music, one comes to appreciate the choral qualities of Pärt’s instrumental pieces as well. And while those have received plenty of deserved attention, Kanon pokajanen is a must-listen for anyone wishing to hear the Estonian visionary in his most enlightened state of grace. The music is almost too powerful, such that listening to the entire album in one sitting can be a draining experience, faced as we are with the prospect of returning to a secular world once its last ghost leaves our ears. If language is, as the composer himself professes, for him a constant “point of departure,” then nowhere is it so intensely communicative than in the Kanon. Anyone who fears that Pärt’s music was a passing fad in an era craving spiritually minded music for the weary masses need look no further than this heavenly spool from which a thread has tied itself around us before we even press PLAY. You may just find something new that has resided in your soul all along. 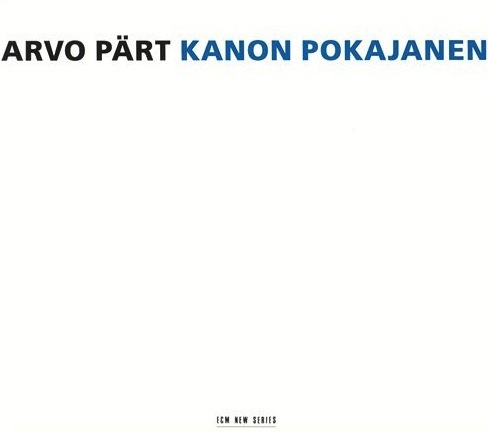 This, Kanon Pokajanen, was the first Arvo Pärt piece I ever heard. I still remember the day, driving around my hometown in Missouri, listening to the local public radio station and hearing it and being drawn in and knowing it was something special, so much so that I Google’d and dialed up the station to ask who the composer was before it finished, and after stayed in my car listening to it in its entirety. Little did I know I would discover even more moving and magnificent works of his: Fur Alina, Miserere, Cantus in Memory of Benjamin Britten especially. So thankful I had my radio tuned to that station that morning. I, too, first heard Arvo Pärt on the radio. It was the Te Deum, in fact. It was also my very first ECM recording and began a lifelong journey of listening. The power of radio, proven.